I'm sure my credentials as something of a map geek when it comes to worldbuilding are well established. I don't know one can seriously do worldbuilding without a sense of where things are, and who one's neighbors are. In making a world map, one has to have a decent sense of geography and earth science to have the whole thing be sensible. Expanding this to an interstellar map, the base science understanding one needs to give it verisimilitude also expands. I, personally, hit a wall at a certain point with higher-math stuff, but I at least try and match star types and Goldilocks-zones and attempt to get the physics of multiple-star systems something approaching correct. Of course, how one works their travel from star-system to star-system affects how you do your maps. For future-worlds that use hyperspace travel, like Babylon 5 or David Weber's Honorverse or Jack Campbell's Lost Fleet series, the actual space between stars is kind of irrelevant. Every star is a key point, and the linking paths matter-- but the result can look more like a subway map instead of islands in an ocean. That's not bad-- it fits the needs of the world and the story. What needs to work is a proper sense of scale, which sometimes gets thrown out the window if worldbuilding is done in an on-the-fly manner, as much of the Star Trek verse was. For all the talk of vast, interstellar distance done on that show, there was still a very real sense that everywhere in the known galaxy was just a hop-skip-and-jump away. The linked map doesn't show-- possibly because it's nigh-impossible with the limitations of a 2-D map-- what was implied in the series: that Klingon, Romulan and Cardassian space all border each other, as well as Federation space. Not that after-the-fact mapbuilding can't yield some interesting results. Both Firefly and Battlestar Galactica implied that their future-civilizations were in singular star systems, but with multiple planets in each one (twelve in BSG, who knows how many in Firefly). 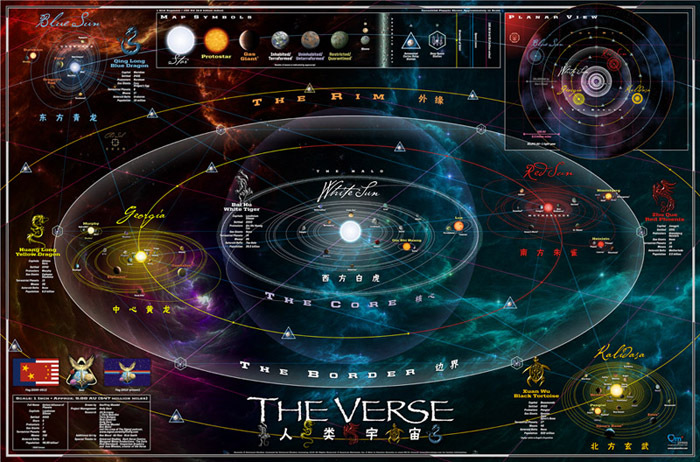 Someone in the creative department (not necessarily in the shows themselves, but in designing the "official" material for dedicated fans) came up with clever ideas, casting both verses as multi-star systems-- and making some very nice looking maps in the process. Now, for me, I'm dealing with near-Earth stuff (something most of those other ones didn't deal with much, frankly-- BSG and Firefly dodged the idea completely). I'm not going to create a map of an interstellar verse that spreads 100 light-years from Earth and not pretend we don't know what stars are in that sphere, and where they are in relation to each other. Of course, what is happening at each those stars is another matter: dead planets, living planets, planets with civilizations, planets that are home to interstellar civilizations? The answers to these questions matter, and need to be taken seriously.